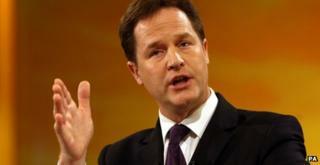 Deputy Prime Minister Nick Clegg has had one of his toughest weeks in government. His hopes of achieving lasting constitutional change are now hanging by a thread - though perhaps the thread is spider's web strong; many proselytisers for Lords reform have persuaded me in recent days there may be some grounds for consensus after all. But on Saturday, he will have to deal with something that might have even more of an impact on his party's chances at the next election, the £10.5bn question: welfare cuts. On Saturday, Mr Clegg will be paying homage to the left of his party, the social democratic group Social Liberal Forum, when he delivers the annual Beveridge lecture on the "five giant evils" - squalor, ignorance, want, idleness and disease. He has been asked to demonstrate how coalition policy slays Beveridge's five. Once that would have been a pretty hard sell (given the audience) but do-able (the government believes their reforms are helping people help themselves). But on Saturday, his job will be even harder. For this will be the first gathering with social democrats since a new political fact entered the landscape - that with growth failing to materialise and in order to keep spending cuts across Whitehall the same as they currently are, the government needs to find a further £10.5bn of welfare cuts - £10.5bn just to stand still. Having howled at those benefit changes already enacted by the coalition, this crowd will want to know how their party uncouples itself from this pledge. Former MP and coalition critic Evan Harris will field the Q&A afterwards. Put it this way... I have been told that unless the deputy prime minister bends his knees adequately to Beveridge, he can expect boos. This is what leads us to the more serious medium term political consideration, how can the two coalition parties agree a set of joint spending plans that spans the next election? Gavin Kelly, formerly of the Treasury, writes about this in an upcoming article. It is unlikely Mr Clegg can sign up to the Comprehensive Spending Review (CSR) as currently envisioned by his coalition partners. So great is the tension that Newsnight has heard from Treasury sources that there are many people planning for the CSR who feel they are going through the motions. They simply cannot see any way that Nick Clegg can sign up to the next spending round. For the Conservatives it is easier to see the headline attraction of going further on welfare (although hard, Nick Boles' speech suggests how: deep into tax credits and benefits). Mr Cameron chose to give his first "what-I-would-do-running-my-own-government" speech on the specifics, quite detailed specifics, of how he would do more to reduce the welfare budget (again: cuts to housing benefit and benefits for out of work parents). If Mr Clegg sanctions £10.5bn more welfare cuts then he could be expediting his own deselection, according to those on the social liberal and social democratic sides of his party. The reception he will get on Saturday is nothing compared to what they would do to him if he signed up to Chancellor George Osborne's plan. Now there are, of course, Lib Dem revenue raisers - scrap higher rate pension relief, bring in a mansion tax, kill off Trident. But these are a) only palatable to the Liberal Democrats and b) needed to pay for some of their future commitments - such as the already manifesto commitment to take everyone on the minimum wage - a salary of about £12,200 p.a - out of tax. Many in Whitehall now think that given the state of coalition relations, the CSR will be delayed until late 2014 (one of Gavin Kelly's insights in his upcoming piece is that councils need to know their April 2015 budgets by autumn 2014). It is my understanding this is almost certain. Even then it is also highly likely it becomes a slimmed down beast - with the Treasury simply handing departments one year spending chits to tide them over to the other side of an election.